It is a convenient stereotype of homeless people; someone with behavioral health issues, perhaps substance abuse, maybe even brought on by PTSD acquired while serving our country in the military. For many of us, that is the face of homelessness, a face we don’t want to look into, lest that frightening thought, “There, but for the grace of God, go I”, and if you want to do something, well, what can you do? These are the thoughts kicking around my mind as I try to find words to describe my experience Wednesday evening as I stood by the ice cream truck in the parking lot of a local shelter. Wednesday was National Healthcare for the Homeless day, and CHC provides health care to homeless people in various shelters around Connecticut. Years ago, I worked on Wall Street. Around the holidays, you would here the perennial question, what do you get the man who has everything? Agi Erickson, our Health Care for the Homeless Project Manager, asked a different question, what do you get the family that doesn’t even have a home? You see, homelessness isn’t confined to just older men. With the current economic difficulties our nation faces, too many families are struggling with homelessness as well. The answer to Agi’s question might seem a little surprising, until you think about it a little bit. NPR has been running a series, “Summer Sounds” which started off with an episode talking about the ice cream truck. Yes, homeless people need food and shelter. Toiletries and clean socks are always appreciated, but the clean socks are something like the socks or ties that so many of us expect to get every Christmas and birthday. 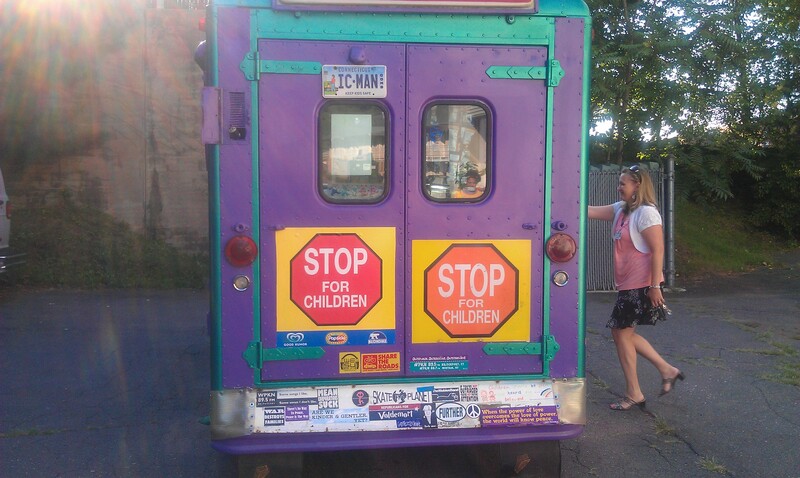 Beyond the basic necessities, homeless people, like you and I, need some unexpected creamy happiness and comfort, and that is where the ice cream truck comes in. 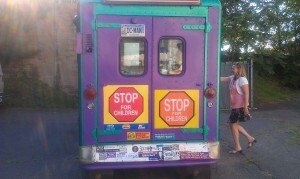 For the past few days, an ice cream truck has been stopping at various homeless shelters where CHC provides health care. Tuesday, it was raining and people asked if the truck would still come. Agi responded, “Ice cream is happiness and rain is not washing that away”. Fortunately, it didn’t rain very hard and people poured out of the two shelters where the truck stopped to get their free ice cream treat. Wednesday, the weather was nicer and the crowds painted a different picture of homelessness. Lining up to get a free treat where dozens of smiling young kids. Once they received their cones they ran off to the playground to savor the sort of joy too many of us take for granted. My old friends from Wall Street were probably pouring themselves a stiff drink after a very hard day in the markets, but a better tonic might have been to see the unbridled joy of a young child who has gone to long without the creamy happiness and comfort of the ice cream truck. Yes, Wednesday was National Healthcare for the Homeless day, yet seeing a little joy brought into another persons life can improve the health of all of us. Dr. Garth Graham, Deputy Assistant Secretary for Minority Health at the U.S. Department of Health and Human Services.